On June 18th, 2012, Cody Wheeler made his first appearance since tearing his ulnar collateral ligament and undergoing Tommy John surgery. In this weeks feature read about Wheeler’s comeback as well has his dominant college career at Coastal Carolina. Wheeler was dominant going 28-1 in his Coastal Carolina career. One start, 5 innings pitched and 5 strikeouts for most Pitchers this would be a pretty average start. Cody Wheeler made this start just this week, shutting down his opponent in his 2012 season debut. It was not just any start however. It was Cody Wheeler’s first appearance in a professional game since he tossed 3 innings after signing with the Diamondbacks as a 5th round draft pick in 2010. In this weeks feature we take a look at Wheeler’s amazing college career and his come back from a torn ulnar collateral ligament. Before the Spotsylvania native started his professional career he starred at Coastal Carolina University just outside of the tourist mecca of Myrtle Beach. As a member of the Chanticleers baseball team Wheeler dominated his opponents in the Big South Conference. During his sophomore and junior seasons he was named 1st team All-Big South and was also awarded as Big South Pitcher Of The Year in 2009. Over his career with the Chanticleers, Wheeler finished with a mind-blowing 28-1 record on the mound. Over the course of his three seasons with Coastal he also averaged over a strike out an inning, fanning 276 batters in 269 innings. 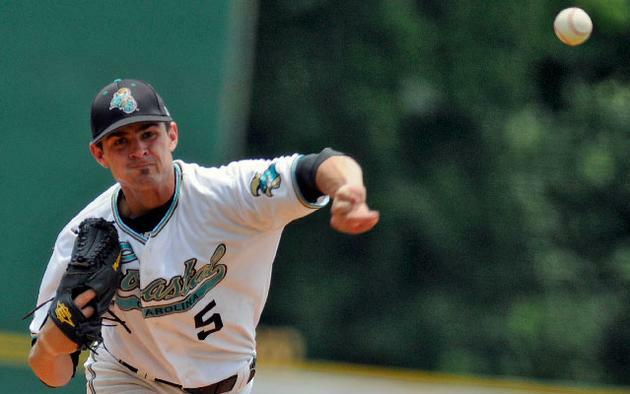 Wheeler has been one of many players drafted into the professional ranks that has helped not only put the Coastal Carolina baseball team on the map but has also lead the school to winning six straight Big South Championships. During the 2010 MLB draft the Diamondbacks selected the lefty in the 5th round. Many around the game of baseball thought the Diamondbacks got a potential draft steal in the 5th round. They thought Wheeler could move fast through an organization and even if he did not remain a starter, he definitely had a future on a major league pitching staff. Once he signed with the Diamondbacks for a reported 170,000 bonus he was assigned to Yakima Bears of the Northwest league. Wheeler would see a small taste of professional action there appearing in three games and throwing three innings. As 2011 approached many thought Wheeler would find himself moving up another level and in the South Bend rotation. That is where Cody Wheeler’s season and career came to a screaming halt. At some point nearing the end of spring training Wheeler was injured throwing a pitch. That injury turned out to be a tear of his Ulnar Collateral Ligament, an injury that would require the three most hated words by a pitcher to be said, Tommy John Surgery. The left handers 2011 season officially came to an end on May 6th as he had successful Tommy John surgery and started his long road to recovery. The long recovery time for Tommy John is hard on a pitcher not only cause he simply can’t pitch but also mentally cause they can’t do what they have been used to doing their entire career, their routine needs to change until their arm is healthy enough to begin to throw. After a long four months Wheeler began to throw, after four more months he began to work on bullpen sessions aimed at getting his mechanics and arm back into sync. Even a year after surgery Wheeler was still working through the process getting his arm strength, command and control back and ready for game action. Finally on June 18th, 2012 Wheeler returned to action, back with the Yakima Bears where his professional career first started. Wheeler pitched 5 shut out innings, the lefty allowed just 1 hit and a walk to go along with 5 strikeouts. While this is a good start for most pitchers on most nights, it was a great start for Wheeler, who is just getting his career restarted. With any pitcher who comes back from Tommy John surgery there will be ups and downs. Getting back on the mound and having a successful first start is the best thing not only Wheeler but the Diamondbacks could ask for. We will be following Cody Wheeler all season long here and on twitter. Please follow Cody @Wheelsonthebus5 and give us a follow at @CTD_Sypien for all the updates on Cody’s progress and the progress of others we have featured on the site. What was it like to be drafted? What where you doing when you found out you were selected, did you do anything fun to celebrate? I’m originally from Spotsylvania, VA. I love to play golf when I’m not on the diamond. Prior to being drafted you starred for Coastal Carolina University. What made you decide to go to Coastal and what was your most memorable experience as a member of the Chanticleer baseball team? Coastal Carolina was one of the first offers I got out of high school. I got comfortable right away with the coaching staff and committed that same week. I have two memorable moments that stand out. The first would have to be my Sophomore year at Hawaii I threw a complete game no-hitter. The second would have to be beating College of Charleston on the fourth day of the 2010 Myrtle Beach Regional. Was there added pressure playing in front of numerous scouts during your final season at Coastal? Who was the Arizona scout who gets the credit for the team drafting you? I would be lying if I said I didn’t feel some pressure, but you learn to channel things out when your on the mound so once I was up there it was just another game. The scout that drafted me was George Swain. You have missed a great deal of time with injury since being selected. Can you tell us how you got hurt and if you can take a little time to tell us about your surgery and lengthy rehab process that you have had over the past year? I can’t really put a finger on the exact pitch that actually tore the UCL all the way but it was last year (2011) towards the end of spring training. I got Tommy John surgery on May 6th 2011. The recovery process was tough physically getting through the pain and soreness, but even more so mentally taxing. Being out of play for that long and being so competitive was tough. About 4 months in I started throwing, which was a huge morale booster. At about 8 months I started throwing bullpens and getting back into the swing of mechanics and such. How is your rehab progressing? Are you close to returning back to action? I am currently at about 75 pitches. Still working out the kinks in the mechanics but the stuff seems to be there. Hopefully in the next month I will be ready to contribute to a team’s rotation. What has been the hardest thing for you about not being out there on the mound on a regular basis? I believe the hardest thing is keeping the mind right. As I said before most pitchers are very competitive so really learning how to channel all that competitiveness into your rehab. Favorite baseball player growing up? Favorite non-baseball athlete growing up and why for both? My favorite player growing up was John Smoltz. Growing up I was a braves fan so watching that rotation of Glavine, Maddox, and Smoltz kinda pushed me towards pitching. My favorite non baseball player would have to be Bubba Watson. I love golf. He’s left-handed, and Phil gets too much love so I have to go with the under dog. My favorite music artists right now would probably be The Weekend, Jay-Z & Kayne West, and you can throw a little John Mayer in there for a rainy day. Finally – Myrtle Beach is known as such a tourist destination if you had to suggest one place for a vacationers to eat while on vacation in Myrtle Beach what restaurant would you tell them to goto? If you are going to myrtle you have to try Liberty, a little micro brewery with great steaks, Margaritaville, with basically anything you want and it will be good. Finally if you like seafood you have to venture down to Pauley’s Island and anywhere you stop will have the best seafood. A special thanks to Cody Wheeler for taking some time out to answer some questions at the end of his rehab. We are excited to see him back on the mound pitching this week. Once again please give him a follow at @Wheelsonthebus5 and follow us at @CTD_Sypien as we follow Cody during the season as he gets closer and close to reaching the major leagues. So happy to finally see your article about Cody! I have been looking forward to reading it and you did not disappoint! All of his family and friends here in VA are routing for him as he continues to heal and to chase his dream. So proud of him! Thanks for doing the story on him, I look forward to reading any updates you post as we follow Cody on his quest for the bigs! Great interview with a great young man. We love to read about him. Many thanks Scott for taking the time to write about Cody. After almost 2 years of rehab, Cody is finally competing again – what he loves to do. This will be another piece of the puzzle getting back on track. Thanks everyone for your kind words! This wont be the last you’ll see of Cody here at Chasingmlbdreams.com – We will continue to track his progress all season long and into the future!